In a little over a month, Gitana will launch the Mono60 Edmond de Rothschild. The second Imoca in the history of the racing stable fitted out by Baron Benjamin de Rothschild, this new craft will quickly hit the campaign trail. Indeed, after an express tuning phase in August and September, the most recent in the legendary family saga will use the Transat Jacques Vabre, due to set sail from Le Havre on 25 October 2015, to size up the competition. For this first foray, Sébastien Josse has opted to race with his co-skipper from 2013: Charles Caudrelier. Just back on dry land after the Volvo Ocean Race, where he secured 3rd place overall with his crew on Dongfeng Race Team, the Breton sailor is eager for more of the same and so it is with great delight that he rejoins the Gitana team for the famous double-handed transatlantic race between Le Havre and Itajaí in Brazil! “You don’t change a winning team!” is the perfect motto for the duo on the future Mono60 Edmond de Rothschild. As was the case in 2013, Sébastien Josse has opted to compete in the Transat Jacques Vabre with Charles Caudrelier; a decision as natural as it is reasoned. After what has been an intense eighteen months for both of them, these two sailors are set to cross tacks once again to their great delight. On 18 November 2013, for their very first double-handed transatlantic race aboard a multihull, it was with great flourish that Sébastien Josse and Charles Caudrelier added their names and that of Gitana to the Transat Jacques Vabre winners’ list. Aboard the Multi70 Edmond de Rothschild, the duo dominated proceedings by completing the theoretical 5,400 miles between Le Havre and Itajaí in 11 days, 5 hours, 3 minutes and 54 seconds. Though this victory was a first for Sébastien in this famous event, it brought Charles’ victories to a total of two, following on from his win in 2009 in Imoca. A few weeks after this arrival in Brazil, as Sébastien Josse put the Multi70 up for refit in preparation for the Route du Rhum, the winner of the Solitaire du Figaro 2004 took off for China, where a significant new challenge awaited him: managing a Sino-French crew comprising professional sailors and trainee offshore sailors in one of the most demanding round the world races. Though the Volvo Ocean Race wasn’t unfamiliar to him, since he won the 2011 – 2012 edition with Groupama, Charles was clearly switching to a whole new dimension by taking on the director’s role. It was an experience he handled to perfection and, just a few days ago in Gothenburg, it culminated in a very solid 3rd place for Dongfeng Race Team. With the Volvo now in his wake, Charles Caudrelier will take a few days rest before hitting the road for Gitana’s Lorient base in early August. 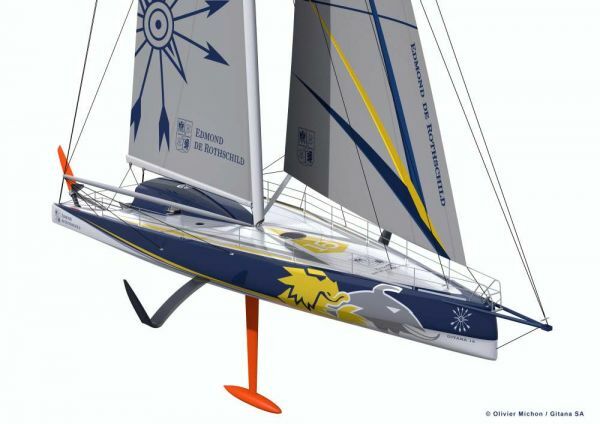 With the Mono60 Edmond de Rothschild just launched, the duo will be able to kick-start their training. Charles Caudrelier’s return to the racing stable fitted out by Baron Benjamin de Rothschild won’t amount to the Transat Jacques Vabre alone. In fact, Sébastien Josse is keen for him to be alongside him for the Vendée Globe adventure: “It is no longer in any doubt that Charles is a great sailor, but he also has a great many other strings to his bow. He knows how to get a boat making headway like no-one else and he is particularly adept at fine tuning these machines, which require long hours and many miles to ensure they are reliable. He showed just what he was capable of in this role alongside Marc Guillemot on Safran as well as with Franck Cammas in the victorious Volvo of 2012. He’s a real asset for our team in the preparations for the Vendée Globe,” stated the skipper of Edmond de Rothschild. At Multiplast in south-west Brittany, the Mono60 Edmond de Rothschild is a hive of activity. Indeed, after over ten months in the yard, the build of the future Gitana has hit the home straight. With a scheduled launch in late July, every day counts in the bid to put the finishing touches to the 18.28m Imoca, which is absolutely teeming in people now on a daily basis. In fact, over the past fortnight, the Multiplast team and the members of Gitana Team have been working on her together. The first section is focusing on the last of the structural work, whilst Sébastien Josse’s men are managing the assembly of all the systems (deck fittings, mechanics and hydraulics…) not to mention the livery of the future craft which, as is always the case with Gitana, has been entrusted to Hubert Corfmat. The two skippers and friends boast sizeable track records with six Transat Jacques Vabre between them in all, including one joint victory in 2013.